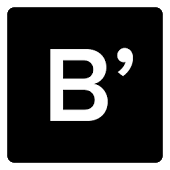 I received a free sample for this post, but all opinions are my own. I strongly encourage pet ownership and believe that pets help us live healthier, longer, more fulfilling lives. We are cat lovers and we have five cats. Because they are an integral part of our lives, I hope to enrich their lives as much as they have enriched ours. They amuse me with their antics. Our kitties snuggle with us in the evenings. Each of them greets us at the door when we return. They also act as my emotional support animals. The best way I can give back to our kitties is keeping them active through play. Besides keeping them entertained, interacting with your pets strengthens bonding, socializes them, and encourages exercise. Since my cats are part of my family, I want to keep them healthy and build that relationship. However, cats easily tire of toys. If you buy a new toy to interact with your purry friend every time they get bored, your pocketbook empties fast! 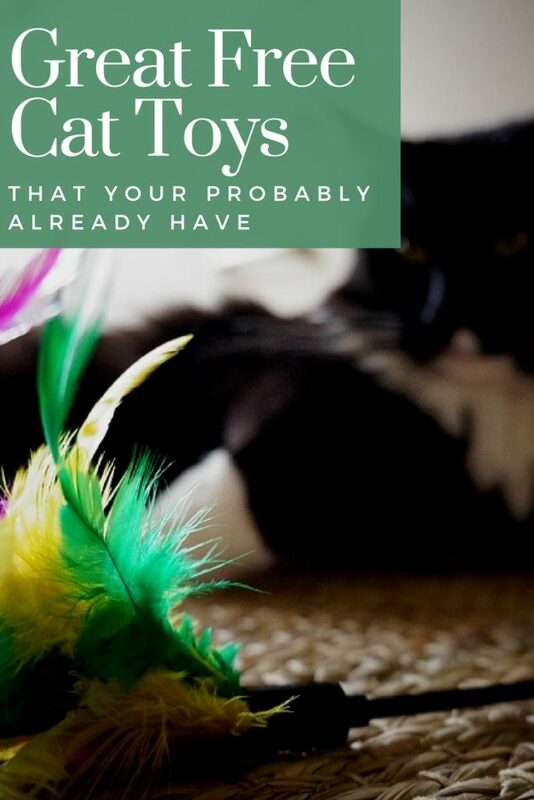 Here are some of my favorite homestyle toys for our kitties. Our calico, Autumn, finds fun in paper bags! As the consummate predator, cats love hiding places. Don’t spend a lot of money on cat cubes if you have any boxes laying around. You can even get creative with them. When he was still a kid, my youngest son loved to decorate the boxes for the cats. One time, he and his brother combined many boxes and created a kitty labyrinth. The cats loved it. Speaking of hiding places, my cats love grocery bags. 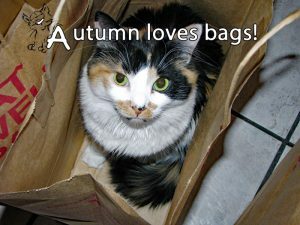 My calico cat, Autumn, loves to jump into them. I’ll scratch the outside of the bag and she’ll slap at the bag where I scratched. Please do NOT use or allow your pet to play with plastic bags. Plastic is a serious suffocation hazard. Cats love to chase things. Instead of spending a bunch of money on cat teasers, re-purpose some old shoe laces. Simply drag it behind you on the floor and watch your cats go crazy! I also like to tie catnip filled toys to shoestrings and allow the cat toys to dangle from the cat trees, door knobs, and other places that encourage the cats to leap for them. Many cat toys crinkle. Cats love crinkly papers and toys. Make your own. Simply ball up a piece of aluminum foil and bat it around. Soon your cat will follow suit, making a fun game for the two of you. Use Catnip spray to refresh your cat’s catnip toys and renew interest in scratching posts and trees. 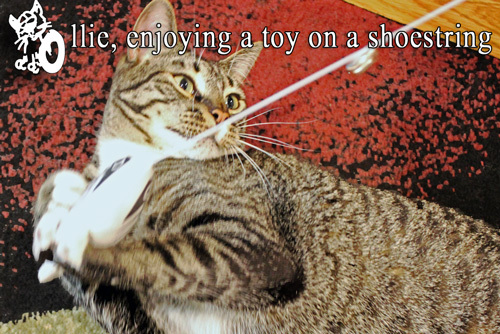 Rather than buy new cat toys, refresh your cat’s interest in his old ones. Change them out occasionally, storing half in a closet for a month. Then, the following month, exchange them out. You can also spritz old cat toys, cat scratching boards, and cat trees with a catnip spray. You can refill some catnip toys with fresh catnip, but I prefer to avoid the mess. Also, not every cat is refillable. 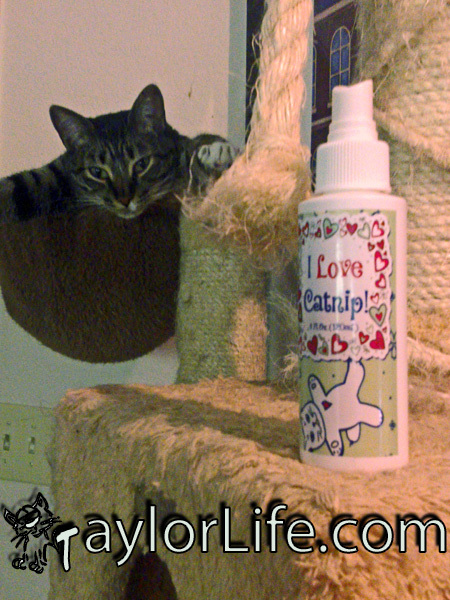 To eliminate toxic chemical concerns, make sure that you choose an all-natural catnip spray. We’ve been using “I Love Catnip“. It’s made with 100% Premium Canadian Grown catnip. It has a pleasant smell and doesn’t leave a sticky residue. 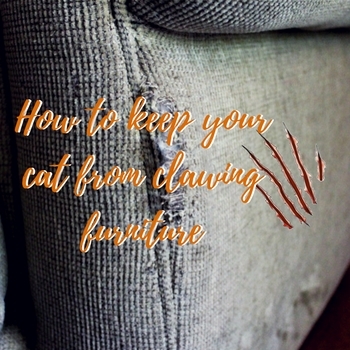 Bonus: I spray it on my cats’ cat trees and scratching pads and it attracts them to scratch there instead of my couch (usually). The smell is almost a fresh minty, eucalyptus-type smell. David says it smells like fresh grass. Oh! And Autumn loves it when I spray her paper bags with catnip. The other cats become more interested in the bag and start pawing the outside of the bag as she returns fire from the inside! My cats also loved it. When I sprayed it on the floor, one of my cats literally licked the floor and started rolling around in it. Since he felt inclined to taste it, I’m happy that it’s a natural product. So, if you are a cat parent, what inexpensive ways do you keep your kitty entertained? I love cats, they are very cute and friends. And adore they play simple things. Our Jude loves boxes and bags! Cats are so great in that they make toys out of literally everything. My cat loves boxes. It is quite entertaining for us, too! We laugh at some of the things she does in that box. Filled boxes are also a great alternative to her scratching my furniture. Yes! I like to fill them with the little balls like you get in ball pits sometimes. I used to have ferrets and they loved that – so do my more playful cats. I have and love cats as well. These are definitely their favorite toys! My cat also loves all things feathers and a lazer pointer. 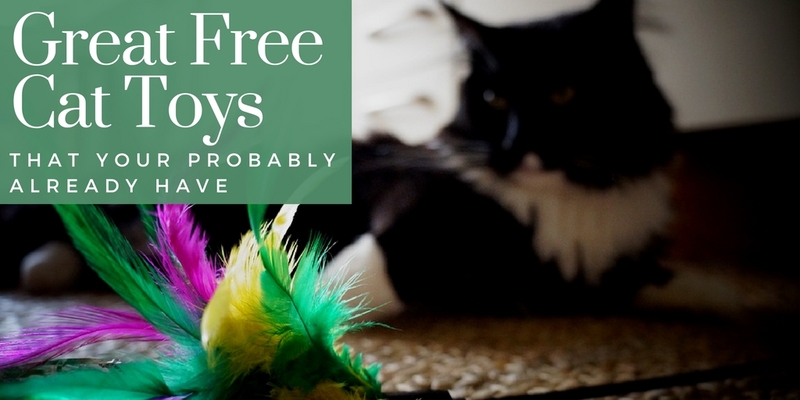 Feathers – yep – my kitties love these, too. One will walk around the house like a tiger with prey. I always watch them closely with feathers, though. I’ve had cats choke on them. I know! I remember spending money on a nice gift for the kids, only to have them play with the box – and the cats are just as bad. However, they do know that those grocery bags usually contain a treat for them. Well, my cats adore their towers – and it usually keeps them from clawing the carpet since it has carpet on it. However, all the other toys? They don’t even acknowledge the existence. 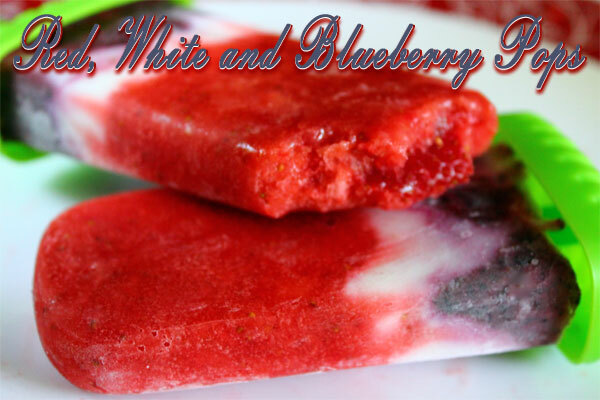 Great ideas and way less expensive than buying toys! I bet a lot of these would work for kids too LOL!! 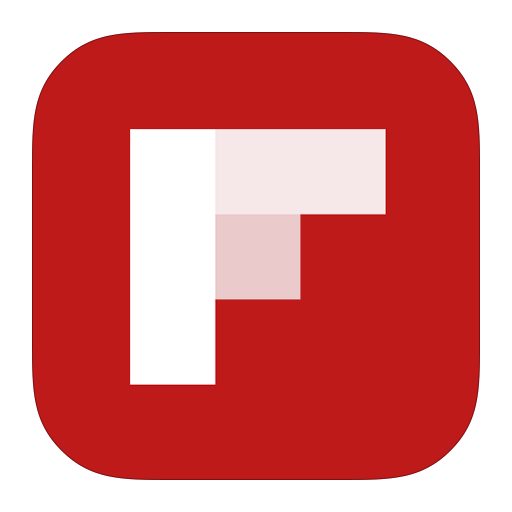 These ideas are super creative. I love the shoe laces. I wouldn’t have thought of that. OMG and you can add newspaper or any paper to that list! Boxes are also a huge favorite here! Oh and plastic bags! I’m a cat owner and it never occurred to me to buy catnip for his scratching post. I will do so ASAP as he loves to scratch my furniture. I found the catnip spray to be a lot less messy than catnip. Yeah! He’s a real “wild” one 🙂 Cats will play with almost anything. I love how curious they are.